Summer is the perfect time to spend a lot of time outdoors with our four-legged friend while enjoying the sun. Don't forget about protecting your dog from a heat stroke. Follow these tips to keep your dog safe this summer! It is summer and we love it! We can spend a lot of time outdoors with our four-legged friend while enjoying the warmth of the sun. But, summertime comes with hidden dangers and an increase in accidents and injuries. By following these simple guidelines, you can ensure your dog’s safety over the summer. Dogs sweat through their hackle, so they lose water this way. The more water they lose, the thicker their blood gets. Our furry friends can lose up to 1 l water from their hackle. Therefore, it’s extremely important that your dog has unrestricted access to plenty of water. Moreover, dogs’ water reserve is only about ¼ of the human water reserve, so even more reason to make sure your dog has enough water to drink. Don’t forget, without enough water, they will suffer and get sick – especially when it’s warm. A dog can manage a long time without food, but without water he’s not going to survive. To avoid dehydration, always bring fresh water when you go outside and offer it to your pup at least every thirty minutes. As a general rule, an average dog needs to drink between 55 to 110 ml. per kg per day. Don’t forget to add a bit more when it’s really hot! During summer, a car left outside in the sun can turn into a real oven in no time. Even at outdoor temperatures of only 24° Celsius, your car will be about 31° Celsius in less than 10 min. Not to mention that after 30 minutes in the sun, the temperature in your car can easily rise up to 40° Celsius! Therefore, leaving the car’s windows open and something to drink for your dog are by far not enough to protect your dog from a heat stroke. Never leave your dog alone in the car, since this can turn into a worst-case scenario for your four-legged friend! Many people don’t know, but our furry friends are just as susceptible to painful burns and potential skin cancer as we are. Some dogs are more susceptible to getting burnt by the sun, while others have natural protection. 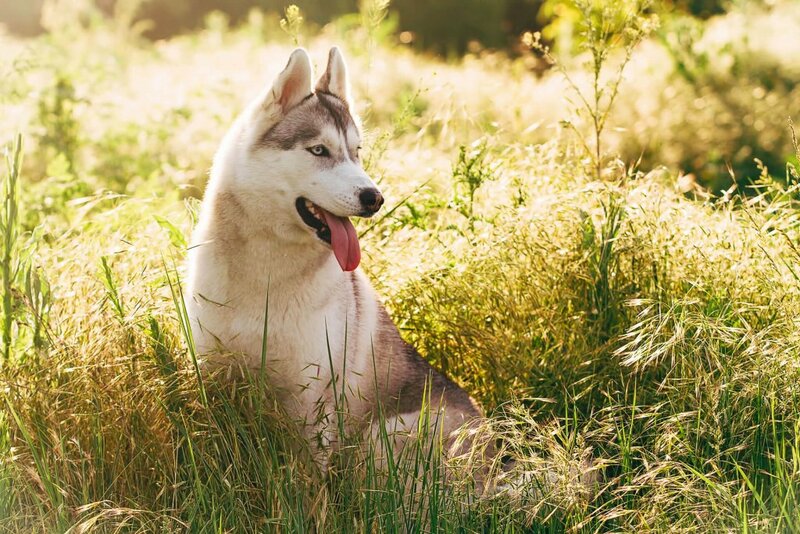 White or light-colored pets tend to have fair skin underneath the fur and a greater potential for sun damage (just like people with blonde hair). Hairless breeds, or breeds with thin hair, are also at risk for sunburn. All dogs, regardless of hair thickness, have risk areas such as the nose, face, and ears. The belly is also quite susceptible to sunburn as it is covered with thin and blonde hair. The best way to keep your dog from getting sunburnt is simply to provide shade. All you need is a big umbrella at the beach, a tree at a park or a roof for your terrace. In the hot season, the same temperature rules apply for dogs as for humans. Avoid going out for a walk in the middle of the day when the sun is strongest! Should your schedule not allow otherwise, make sure to choose routes full of shadow through parks and woods, where there are various possibilities to stay out of the sun’s radiation. The normal body temperature in dogs lies between 38 and 39 degrees. 40° degrees body temperature already means fever for your dog. 41 degrees or more are dangerous and can even cause severe health damages, including death. It’s a fact that fleas and ticks are attracted to your dog. Your pet provides a warm and furry environment for the fleas to have fun in. In the summer, when we all spend more time outside, parasites tend to come out, hungry and looking for a cozy home. And your dog is the perfect host! and bring your furry friend directly to the vet if these symptoms should occur. If you have a pool or go swimming at the beach, a life jacket is a good and important investment. Even though dogs are good swimmers, they can drown just as easily as humans. Especially smaller breeds, older dogs and puppies might not have the strength to get out of the water once they’ve fallen in. Anything can happen in water and it pays off to be prepared. Life jackets for dogs are available in many different sizes so make sure to choose one that fits your pet perfectly. Especially if you want to bring your pup on holiday – camping or hiking in an unknown area – you should consider investing in a dog tracking device. Some dogs are rather adventure-seeking and you never know if your pup will suddenly escape to explore the area. Save yourself a lot of trouble with a Tractive GPS for dogs. Curious of other benefits of having a Tractive GPS Tracker for your dog? The infographic below shows you the most important thing you should know about dogs and heat – because it can be life-threatening! Generally, don’t give your dog ice cold water to drink, since his body will need to warm it first. Like what you’ve read? Share these useful summer tips with your dog-loving friends! Walking the dog in the dark: Beware of these dangers! These tips will help you stay safe in the dark while walking the dog! These tips will help you teach your pup that being home alone every now and then is OK! Your dog's need to run away is natural: learn why and keep your dog safe. Find out where your dog spends his time. Immediate help to find your lost dog in Glasgow! How to increase your dog’s motivation? Here are 4 ideas that work! Which dog breeds are most likely to run away?